Our program caters for Babies from 5 months, Toddlers, Preschool, Prep aged children and School age children. The great thing about our program is it has been developed over seven decades and is applicable to all ages from babies to adults. In the late 1930’s Thomas “Pop” Shapland was teaching swimming in the old Toowoomba Municipal Baths. In 1947 his son Bernard “Bernie” Shapland took over the lease of those Municipal Baths and continued to teach swimming locally and coach swimming at the elite National level. 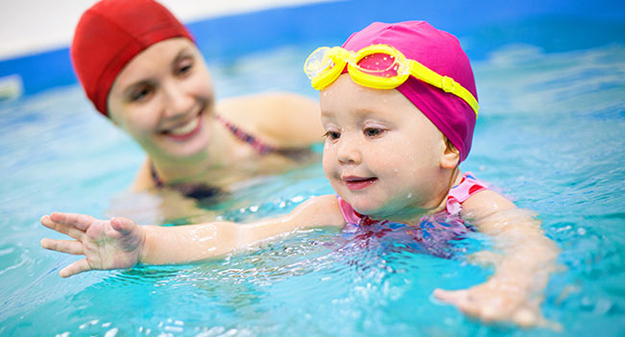 In 1992 Chris Shapland, who taught his first swimming lesson at age 9, was faced with documenting the method his family had uses for six decades so that Shapland Swim Schools franchisees and teachers had access to a simple, effective, tried and proven method of teaching swimming. It is a simple method and based around five steps or skill levels. Once our teachers understand the simplicity of the program they are encourage to use their own words and phrases to Personalise the lessons according to the wide variety of students who are in their charge in the pool. Every child deserves to have fun while learning how to swim and the Shapland Swim In Five program allows our teacher to make this happen.